I was considering reviewing some of my outfits and sharing my favourites from 2015; honestly, I don't feel like writing a post on my outfits, as I seldom don anything that's worth posting about, despite wanting to expand and include more outfits in my blog. I decided to share some of my favourite finds while raiding the Charity shop. I found this polar neck jumper, made by John Lewis for £1. I have a fondness for polar necks, especially during the winter as the jumper covers my entire neck, so I don't need to wear a scarf. I also like the pearl button detail on the sleeves. The cardigan was an absolute bargain for fifty pence. I love wearing cardigans for the summer, and this is no exception as it's a lightweight cardigan, comfortable to wear during rare sunny days. 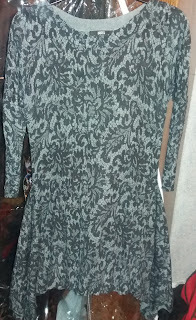 My favourite parts are the scallop neck detail and the silver, black buttons. The blouse was a gem find; I found it after leaving work, made of silk chiffon, and paid a £1. 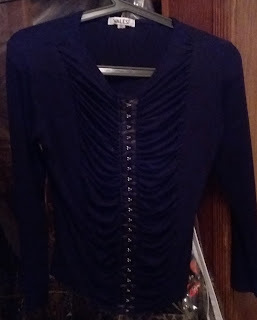 I like blouses, but rarely don them as I prefer wearing stretchy tops that I can pull over my head, I couldn't resist this one since it's silk-chiffon it has a some stretch and comfortable without being too restrictive. The sleeves are billowy in appearance and taper at the end with an elastic cuff. 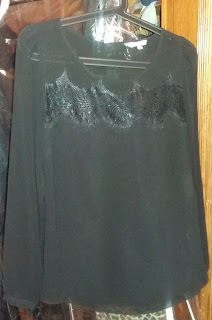 I fell in love with this top it's a great chiffon top that would complement my maxi fitted skirts. I love this top and the lace detail across the blouse. I even like the bishop style sleeves which has a flowy appearance with a small button cuff. I even like the round neck top that's complimentary to my body shape. 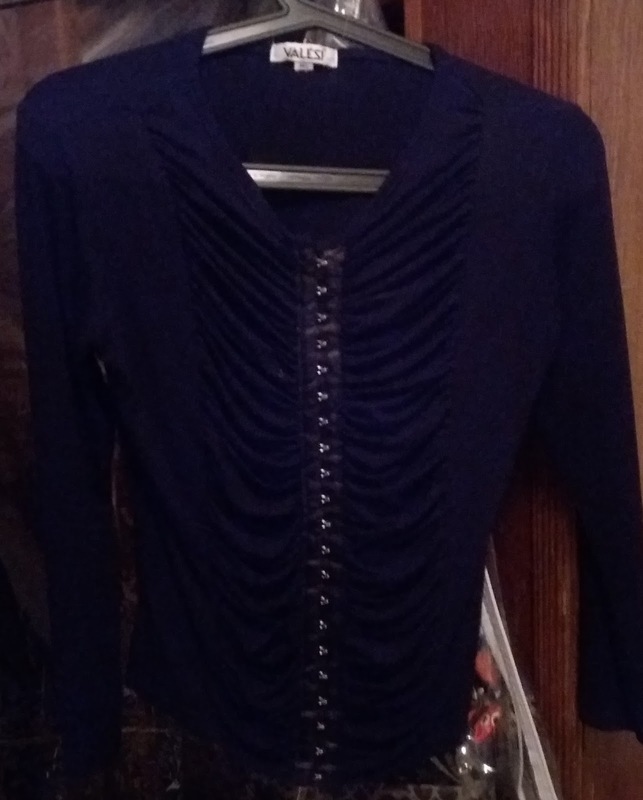 I bought this top for £1; this is one of my favourites it's so comfortable to wear a beautiful ruffle detail with the ribbon trim hook and eye detail. It has a great witchy feel to it. Another cheap find for fifty pence, it's my highlight of charity shop finds. 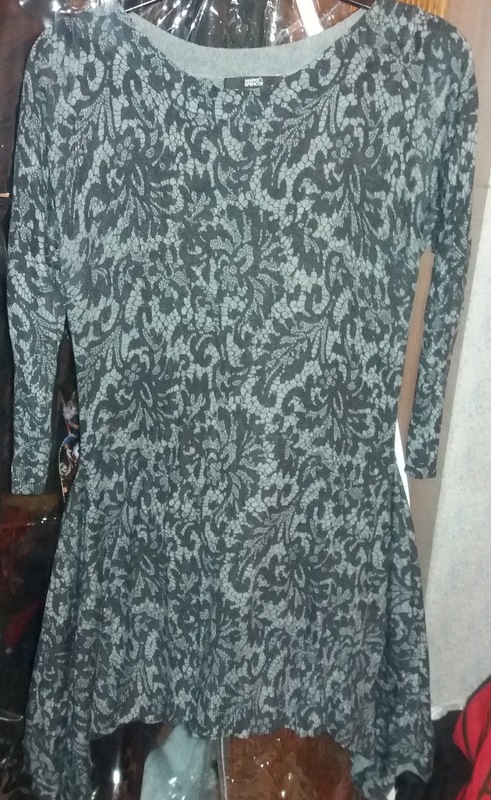 I love the pointy detail of the dress and the grey pattern detail, it's so comfortable to wear. I like the gothic style fifties skirt, I haven't worn it yet, can't depart with it; I bought this for a whopping £1.99, it's made from polyester taffeta, my favourite is the is the flocked rose pattern and the velvet trim details. Thanks on my favourites, but not sure to wear it. What grwat finds! 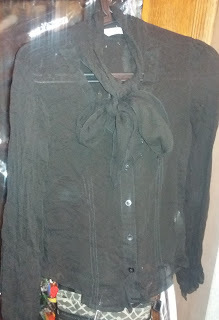 Especially jealous of the chiffon bow blouse! Thrifting was one of my favourite pastimes since childhood but shops seem pricier and less good quality these days! I love thrifting I've been doing it since 11, when I used to go on shopping trips to Gateshead by myself. I have noticed a deterioration in items quality and an increase in prices but there are still bargins, unfortunately it's case of luck and searching. Now adays I can look through about a dozen shops without find anything. Everything I've found has been over the last year. I still get excited when find something no matter the cost.